While it’s possible, I doubt the image will get overwritten with rollups or service packs. Video: Microsoft Lync – What’s Amazing? See what’s amazing about Microsoft Lync including audio and video, instant messaging, and voice. Lync Attendant is an intuitive call management application that helps you manage large numbers of simultaneous calls. Lync 2010 Attendant runs in a full screen window to provide a streamlined desktop experience. My favorite mouse is the Microsoft Presenter 8000 mouse. It’s comfortable, gets great battery life, and has the presentation buttons and laser pointer built into the bottom. Unfortunately, after many many trips through airports, my mouse finally died. I decided to see what else was available. 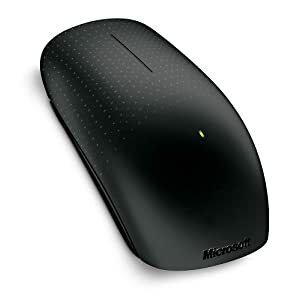 I’d tried the Microsoft Arc mouse, but didn’t find it that comfortable, and the “back” button on the side wasn’t in an ideal location, and was quite stiff. A colleague had reported that the newer Arc Touch mouse was kinda cool, but he didn’t like it after trying it. Microsoft recently released the Touch Mouse. This is a uber cool mouse that has no real buttons on the top or sides. It uses finger gestures and the entire top is a giant button. The unit supports one, two, and three finger gestures in a variety of directions, as well as thumb gestures in two directions. The unit includes a micro dongle that stores in the bottom of the unit. It is powered by two AA batteries, and has an on/off switch on its belly. Setup was a breeze. The mouse is designed specifically for Windows 7. I inserted the dongle, and within seconds, a tutorial popped onto the screen demonstrating the various features and gestures. It walks you through each gesture, shows you what it controls, and then has you do the same thing to get the hang of it. I found the tutorial to be the perfect combination of information and length. There are certainly a lot of gestures you can use. Single finger gestures include the normal scrolling up, down, and sideways. Two finger gestures include docking apps to the left and right side of the screen, restoring and maximizing apps, etc. Three finger gestures include minimizing and maximizing all apps. And the thumb gestures work great for forward/back movements, such as those in your Internet browser. Button clicking is based on which finger is touching the unit when you press the forward part of the unit down. This is a nice mouse. It works great, although it did take some getting used to when I needed to right-click on things. I’m not sure how often I’ll use some of the gestures, but it’s nice to see the availability of them. Scrolling up and down really gets going if you swipe quickly, and lift your finger off the unit – something else I had to get used to since I typically used a wheel that would only turn so far when I’d let go of it. The $50 mouse was a great addition to my travel tech gear. It would have been nice if it came in a plastic shell, like the Presenter Mouse does. I just use the cloth pouch from the Arc mouse and it works great. I’d recommend the mouse if you’re looking for something slick. I think I’ll get another one for my desktop at home. These days, I spend more time at client sites than I do in my home office. My home office has four monitors for my desktop. When at a client site, I’ve beenÂ stuck with just a single screen for my laptop. This can be tough getting used to, and be quite limiting. Toshiba came out with the perfect solution. 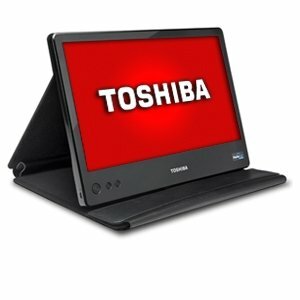 Their $200 14″ USB monitor that folds completely flat, and takes up less room than my laptop in my backpack. The monitor comes with a dual plug USB cable to ensure that it gets enough power to operate. From my Dell Precision M4500, I find that it gets enough from just one port. I keep the original cable in my backpack, and use just the Griffin mini USB to the monitor. This is essentially a 2″ cable that works perfectly. Toshiba does sell an optional power supply, but I’ve yet to find a need for it. The screen gives me 1366 x 768 resolution, and provides perfect screen real estate to keep my Outlook and other apps open while I use the laptop’s main screen for my current focus, such as documents, etc. Setup of the monitor each day is trivial. Open the unit like a book, close the flap, and stand it up. Connect the USB cable, and you’re done. Initial setup merely required the CD-ROM for the drivers, and took only seconds. From unboxing to operational took me less thanÂ five minutes. Front panel controls include power and brightness controls. There is a little velcro flap in the middle of the case to store the cable. I absolutely love this monitor. It provides extra working room for me to be more efficient. It takes up very little space and adds very little weight (3.7 pounds) to my overall carry load. Setup is a breeze, and the unit just works. The only thing I could complain about is that the bezel along the bottom, which includes the control buttons, is a bit large. It would be nice if it were smaller, and provided more screen space instead. But that’s trivial. I would recommend this unit to anyone who would like to have more working room, but need to travel with it. It’s available from Amazon.